The origin of life is still a great mystery to evolutionists, so it’s not surprising that there’s a never-ending quest for stories explaining how life could have arisen spontaneously and without the need for invoking God. The latest story from ScienceDaily tells us that the first cell “may have” originated in a “salty soup”. The article highlights some of the problems concerning origin of life research and compares it to the chicken and the egg dilemma. It explains that cells don’t function without a cell wall, so how is it that we can get a cell wall if there’s no cell? In an attempt to answer that, Chemists at Radboud University Nijmegen conducted an experiment and published their results in the Proceedings of the National Academy of Sciences. During the experiment biomolecules (such as DNA, RNA, enzymes and proteins) were added to a solution, and they found that these large biomolecules spontaneously clustered together when the salt concentration was increased; they concluded, therefore, that a cell wall is not a prerequisite for a cell-like structure. Chemist Wilhelm Huck speculates that the macro molecules in our cells evolved to do their work while packed closely together. There are a number of problems with these suggestions, however. One problem rests in the salinity and age of the oceans. We know that there’s more salt entering the ocean than leaving it, so the salinity of the oceans has increased over time. This means that today’s oceans are more salty than they were in the past. This problem has been known for some time, and was first proposed by Sir Edmond Halley (of Halley’s Comet) as well as John Joly (1857-1933), a geologist, physicist, and pioneer of radiation therapy. Joly estimated that, based on this known process, the oceans were only 80-90 million years old. And most recently geologist Dr. Steve Austin and physicist Dr. Russell Humphrey’s calculated the oceans to be less than 62 million years old, granting the most generous assumptions. This means that, if we accept the premise of the article, the saltiness of the oceans today would be far more conducive to life spontaneously forming than they would have been in the past (yet no one is reporting any spontaneous new life-forms). And it would be problematic for large biomolecules to cluster together in the past when there was much less of a concentration of salt. And that doesn’t even take into consideration that secular scientists believe life first evolved in the oceans some 3.5 billion years ago. Huck rightfully acknowledges that “A functioning cell must be entirely correct at once, in all its complexity,” yet the article doesn’t address where these large biomolecules came from in the first place. For instance, DNA couldn’t exist without RNA, and RNA couldn’t exist without DNA. So the article makes some major assumptions- that all these biomolecules existed at the same time and place in all their complexity, and that somehow the water was salty enough to encourage them to concentrate together. 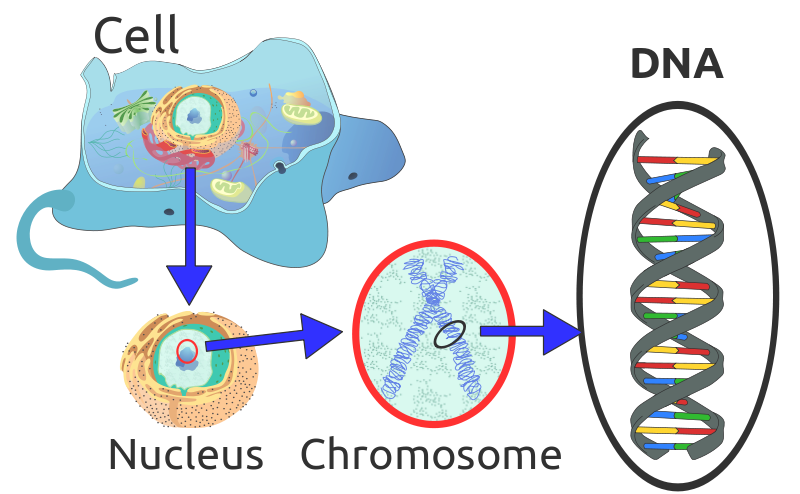 Huck also assumes that once these biomolecules concentrated together they would be able to function, carry out the instructions provided in the DNA, and do the work necessary to survive, reproduce and utilize an energy source. But before we can even consider such assumptions, it’s important to have a better understanding of what Huck means when referring to the complexity of the biomolecules he and his colleagues started their experiment with. DNA is the most compact information storage system known- and here’s one way to picture just how complex it is: the amount of information that can be stored in a sample of DNA and placed on the head of a pin can be compared to the equivalent of a pile of paperback books 500 times as high as the distance from the Earth to the moon, and each book containing different, but specific instructions. For a closer look at this amazing complexity, take a quick look at the links at the end of this article. To imagine how all this could have all began in a salty environment which may not have even existed is ridiculous and requires an incredible amount of faith. Lastly, Huck tells us that we’re “closer to building a synthetic cell than anyone ever before us.” This may be true, but just because scientists may be able to intentionally and deliberately build a synthetic cell, that doesn’t mean that life arose spontaneously all on its own. I find it far more believable that God created the heavens and the earth in six days just as he told us he did (Exodus 20:11).